This post has been getting a lot of traffic from Pinterest! To everyone who may be making their way here from Pinterest - if you have any questions about the menu items (recipes), invite or children crafts just ask in the comment section at the end of the post and I will get back to you! We held a Christmas Open House this year to kick off the holiday season! It was the first weekend in December and was therefore wonderful motivation for me to get the house decorated and ready for the season! We decided an open house was best because then people could come and go throughout the evening at whatever times worked best for their families (we have some friends with very little children and others without children) We served heavy appetizers that could withstand being out for a few hours and non-alcoholic and alcoholic beverages. Of course, we also had desserts! 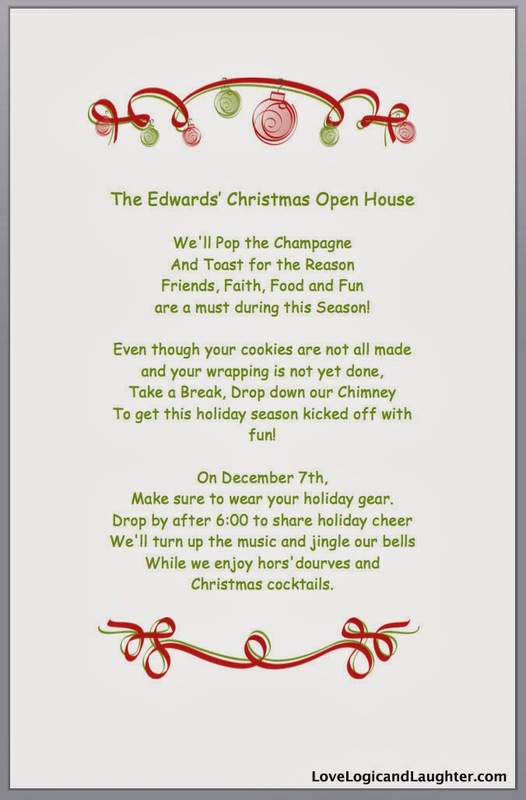 Our Christmas invitations (above) went out a couple weeks before the party. I love Christmas Jingles! The menu for the evening was displayed on our large chalkboard hanging in our dining room. I think my favorite menu item was the poached salmon. The presentation added so much to the tablescape - it was a decoration on the end of the table! The punches were marked with chalkboards so that there would be no confusing which was the adult only punch and which was the child-friendly punch. The two punches were also placed on separate tables so they really couldn't get confused! Look at these adorably cute cocktail napkins! They worked perfectly with our Punch Name: Rudolph's Tipsy Spritzer! We opened our Hot Chocolate Bar for the season! Here are all the details regarding the Chocolate Bar. It was a hit! The very large thermos we had holding the hot chocolate was gone by the end of the night (along with most of the marshmallows)! Since we had a lot of children we set up our kitchen table as a craft area. We provided lots of clear plastic ornaments (only one in the picture below that is already painted), glitter paint and for the older children ornament sets with pipe cleaners pompoms glue and scissors. This table was definitely a hit with the children and the adults got a little more time for adult conversation while the children were crafting! Every Age Craft Ornaments: these were the biggest hit - all you do is take the ornament top off, squirt in some paint, put the top back on and swirl it around! Wallah! A homemade ornament! Older Children Craft Kits: These kits required following a few directions, but the older children enjoyed them. Overall it was a successful evening! We played Christmas music and mingled with friends to kick off the holiday season! Now we feel like we are in high gear and ready to go for Christmas! Eliana in our coordinating outfits for the party!